A Place to Bury Strangers have shared a new song as part of a new anti-Donald Trump project. We are sorry for mentioning him again. 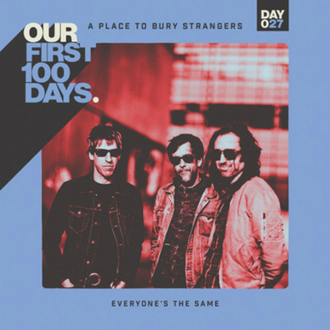 The New York post rock group have contributed the typically furious, crunching ‘Everyone’s the Same’ to Our First 100 Days, joining the likes of Angel Olsen, Suuns, Pete Silberman of Antlers, Jason Molina and Animal Collective’s Avey Tare. ‘Everyone’s the Same’ sound like classic APTBS. Oliver Ackerman’s vocals over breakneck drums are punctuated – and the song is bookended by – increasingly dissonant guitars, overdriven to the point of near-white noise. The idea of Our First 100 Days is that a new song will be added to the playlist every day for the first 100 days of Trump’s presidency – sort of like a Guardian liveblog in Spotify format. The minimum donation for the whole thing is US$30 and the proceeds are donated to charities whose work Trump and his cabal of supervillain puppeteers have opposed or damaged in some way. These include All Above All, Cosecha, Hoosier Action, People's Climate Movement, and Southerners On New Ground. Also slated to be joining the project are Mitski, Whitney, TORRES, The Mountain Goats, Jens Lekman, Twin Peaks, Wild Nothing, How to Dress Well and a bunch more. You can listen or donate right here. Selena Gomez has clocked up 110 million fans on Instagram. Britney Spears shared a powerful Bible verse on the 10th anniversary of her head-shaving incident on Thursday (16Feb17). Marc Anthony has reportedly embarked on a new romance with a model 27 years his junior following his divorce from Shannon de Lima. Keith Urban has topped the Academy of Country Music (ACM) Awards shortlist with seven nominations. Fifth Harmony's Lauren Jauregui has been recording with Steve Aoki. Rag'n' Bone Man doesn't have 'perfect voice'. Rolling Stones rocker Mick Jagger wrote a 75,000 word autobiography and then forgot about it. Adele made more than £500,000 ($625,721) each night of her world tour. Sam Smith has penned a track with Frances for his forthcoming new album.